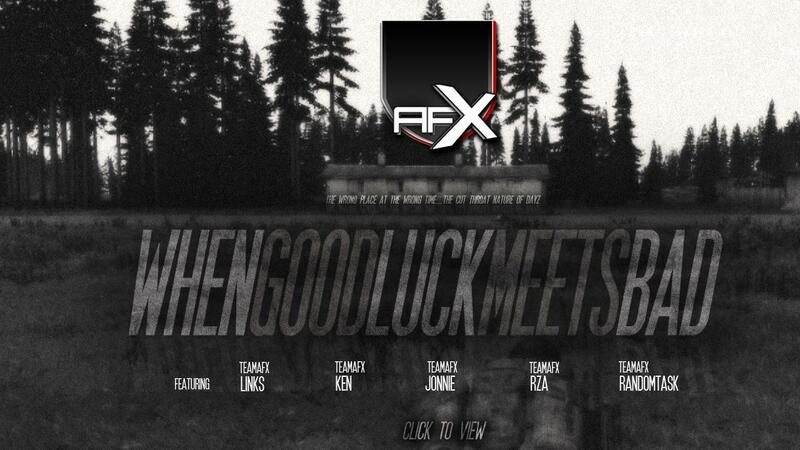 After Effect • View topic - teamafx.DayZ Youtube clip "When Good Luck Meets Bad"
teamafx.DayZ Youtube clip "When Good Luck Meets Bad"
Latest youtube clip now uploaded! this is the first clip I've put a bit of effort into editing so I hope you enjoy the difference compared to our other bog standard ones. I've tried to go for helicopter thermal imaging feel for our locations on the map and done a cool little intro video. The footage itself is of us raiding the North West Airfield last week when we ran into some trouble. I would say this is probably the most crazy run we've ever done as everything was just so unexpected....on another night it could have panned out completely different. Please like the clip on youtube's and upvote on Reddit! : http://www.reddit.com/r/dayz/comments/x ... meets_bad/. Cheers!